Seabeck, west of Silverdale along the eastern shore of Hood Canal was historic mill community. Once a bustling seaport that dwarfed Seattle in population and size. The small town was known as the “liveliest town on the peninsula”. In its heyday it was known to cater to bootleggers, rumrunners and other characters alike passing through. After the mill and shipyard where destroyed by a fire in 1886 most of the townspeople moved and now there are few traces remaining of its early logging years. 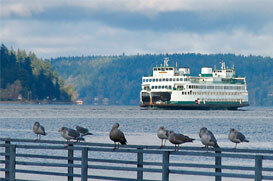 Seabeck makes a great home base for the many activities available on Hood Canal. There is the Seabeck general store with a wonderful quant café located behind the store with postcard views called Barbie’s Seabeck Café known by many as “Better than your mamma’s cookin”. Many of the Seabeck Residents have endured a long wait for a new marina; construction of its newest development, the Olympic View Marina has taken place where the old marina, shipyard and former mill all once occupied the marina site. Once the Olympic View Marina is completed it will serve boaters with 200 slips and a fuel dock. Nearby is the Seabeck Conference Center that holds many events during the year and for over thirty years it has hosted Deaf-Blind visitors from across the nation and world, The Lighthouse for the Blind, Inc. has held its annual Deaf-Blind Retreat there. For more recreational activities visit Scenic Beach State Park, take a hike to Guillemot Cove Preserve where you might find some traces of the old sawmill, or rent kayaks to take a leisurely tour of Seabeck Bay.